I’m not really the stable blogger, churning out a steady flow of blog posts week after week…and I probably never will be. Too much else is going on all the time. Too many projects, conferences, meetings, talks, articles, teaching, trips abroad, games, people and other exciting stuff. I love it. A bit hectic at times, but still; terrific. I do have a couple of new posts coming up, yet I thought I’d also like to try another approach. I’d like to try going back. A new direction for education? The remainder of this post is a kind of summary of all that I’ve written on the blog. It is at the same time a summary of most of my thinking regarding digital media, games & learning. I’ll cover the first three topics in this post, and the last one – games & learning – in a separate one, as this is a subject I’ve covered in a large number of posts. As hard as I may try, I’m probably not able to appropriately highlight exactly how important the sharing of knowledge is. In “knowing together?“, I briefly touched upon collective intelligence and how it “exploits the potential of network culture to allow many different minds operating in many different contexts to work together to solve problems that are more challenging than any of them could master as individuals”. Throughout my work – and life – I try to promote “transparency as an ideal“, which I even describe as my business model. Increased sharing is a big part of the solution to the challenges of education, but “how do we nurture a culture of transparency in education? How do we make it not only feasible, but attractive to share?”. I wrote a blog post on Twitter, which described “why I love Twitter (and you probably should too)” and in which I was able to quite Niels Bohr’s request for “free access to information”. I focus on Twitter, but I try to place Twitter within a larger framework of transparent communication and collaboration. In my latest post on this topic, I end up shouting in order to encourage people to “share EVERYTHING“. This was sparked by a couple of thought-provoking incidents, which made it all too clear, that sharing is often considered much less important than creating knowledge. I recommend to not “fear experimentation. Try different methods, tools and approaches. Mix online with offline, writing, talking, showing. Be a little more ad hoc’ish – .anarchistic if you like.” We should experiment with the ways we share, and we should not wait until any “final” results; share the process as well. Throughout my writing on this blog (as well as in most of what I do), I argue in favor of change. This is most prominent when talking about education, as I wholeheartedly believe, that radical change is needed. Inspired by the many game jams taking place, I suggest that we start “jamming in education“. I would love to see education jams, in which we “summon a large number of dedicated, creative teachers and relevant practitioners, release them from the everyday constraints (if only for 48 hours) and indulge them to work out new experimental solutions”. We need to say and do things differently. When one approach doesn’t work, we shouldn’t just do the same again; “don’t just repeat; rephrase!“. I have a profound problem with our current framing of cheating in education; not least because this practice effectively means, that “I’m a cheater“. “What is considered “cheating” in school, is considered “creative, innovative problem solving” outside school”. This is important because we must not underestimate “the importance of relevance“. If learning contenst is isolated from proper contexts, chances are, that most students won’t understand the relevance and importance of said learning content. If they won’t understand the relevance, they’ll have a very, very hard time learning anything. We also need to focus on new skills and competences. One such set of competences is comprised by the notion of “entrepreneurship” and the ability to “embrace the initiative“. Quoting Seth Godin, “most people don’t believe they are capable of initiative”. This is sad, and we as educators must be better role-models in inspiring students to think and work like entrepreneurs, who are willing to experiment, take chances and – from time to time – fail. My latest ponderings on new directions for education was inspired by a little yellow duck (made of LEGO bricks). Guess I was in a poetic mood when I wrote about “the simple beauty of a duck“, yet my arguments were surprisingly well aligned with what I’ve written elsewehere. “Less scaffolding and rigid rules, more freedom and exploration”. It’s becoming increasingly obvious, that we cannot rely solely on traditional notions of “literacy” in a world, where digital media is as pervasive and important as ever. This is only accentuated by the oft-cited dichotomy between digital natives and digital immigrants. I’m quite skeptical about the value of these terms, and argue that “digital natives get lost too“. We need to understand, that digital natives are not really that competent, and that being competent means more than “pushing buttons”. Digital competence can also be understood along the lines of “digital literacy” and I’ve been quite inspired by “a model for digital literacy” put forth by Futurelab. The value of this particular model is, that it makes it very clear, that digital literacy consists of many different skills and competences. That’s it for now. I’ll be back very soon with another post summarising my writing on games & learning. I can’t stop thinking about context. I mean; context is really-really important. Do you ever do anything meaningful without it being embedded in a proper context? Context is that which surrounds, that which adds depth and imbues our decisions and actions with meaning. Turning to education, learning in educational settings has for way too long been confined to a life in isolation within the boundaries of the individual institution – and this to an extent, where students’ attempts to break the isolation are frequently considered “cheating“. In the most dystopic of scenarios, schools “teach to the test“, as it’s (un)popularly expressed. It’s as futile and meaningless as it gets, really. Teaching to fulfil a very specific purpose internal to education without paying attention to the needs of the world. In addition, each topic is isolated from one another, effectively creating an artificial situation which in no way mirrors the interdisciplinary complexity of the world outside school. What it does mirror, unfortunately, is the industrial paradigm of the early twentieth century. When content is isolated from context, and the same goes for the different subjects taught, I can’t help but think of the tayloristic idea of scientific management. 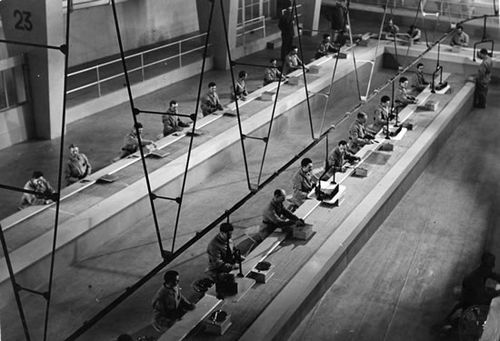 Any distraction is removed in order to increase efficiency within a closed system, where each worker contributes only to one small part of the whole process. That worker probably doesn’t have any idea as to why she is doing what she does, or how her effort fits in a larger context. Learning should be relevant, and ideally it should always connect to the world and the life of the students. It should be clear to the students why we want them to learn this or that, and how said learning could be applied in the larger context of society. This is not just me rambling, as many learning theorists have proposed similar ideas, most prominently probably Jean Lave & Etienne Wenger in “Situated Learning” and Wenger later in “Communities of Practice“. In short; education always needs to build on contextual awareness. I’ve already labelled educators “designers”, but perhaps a more precise label would be “contextual designers”? So. We should not practice education without contextualising said education. Fortunately, we may actively appropriate media as tools for building relevant contexts for learning. All kinds of media are imbued with the potential to bridge the gap between the classroom and the world outside. Take the wide array of freely available social media. Traditionally, written communication remains in a closed circuit including only teachers and students. This has some serious negative implications for the experienced relevance of written assignments, as students see no value in their work, except as yet another possibility for the teacher to assess their current level. Why not embed those assignments in the dynamic ecosystem of online media? Whether you choose to let students write blogposts or Wikipedia entries, discuss topics on Facebook, produce videos for YouTube, engage in communication on Twitter, perform intervues – or all of the above – is less important. What really matters, though, is that you challenge the traditional borders of the classroom. Break them down with a sledgehammer. Set the students’ work free – but don’t let them off entirely on their own. They still need support, guidance, sparring. If you doubt the value of this, think about your own motivation to do things, which have no clear purpose or which contributes in no way to the world. I, for one, don’t care much about doing such things. Games, analogue as well as digital, make for another important example. Every single good game in the world creates a framework – a context – within which the player takes certain actions in order to beat the game. Whatever these actions may be, they merely consist of pressing buttons, moving sticks, swinging a controller or jumping in front of the screen. This again leads to a variety of consequences – shooting russians, fighting dragons, managing resources, racing cars or solving puzzles – which seem relevant to the player, but only because of the context, in which they are embedded. Was it not for this context, figuring out how to do those things would probably seem as irrelevant as figuring out how to do social sciences, math or chemistry. Now, context in relation to games can consist of many different components. The fictional world is one such context, providing us with a more or less satisfactory narrative to explain our actions. Another context infusing a sense of meaning and relevance to our in-game actions is rooted in the human need to be social. If our actions turn into interactions and in one way or another become meaningful for someone else as well, allowing us to build and nurture relationships, then we have a deep, meaningful and valuable social context. More than a multibillion-dollar industry, more than a compelling toy for both children and adults, more than a route to computer literacy, video games are important because they let people participate in new worlds. They let players think, talk, and act in new ways. […] These rich virtual worlds are what make video games such powerful contexts for learning. In game worlds, learning no longer means confronting words and symbols that are separated from the things those words and symbols refer to. […] In virtual worlds, learners experience the concrete realities that words and symbols describe. Through these and similar experiences in multiple contexts, learners can understand complex concepts without losing the connection between abstract ideas and the real problems they can be used to solve. In other words, the virtual worlds of games are powerful because they make it possible to develop situated understanding. David W. Shaffer is himself pursuing the directions outlined in the above, when he is doing research in the “Epistemic Games Group“. They create games, where players take on the roles and the epistemologies of engineers, city planners, journalists, graphic artists or negotiators. They work within the context of the professions. Serious Games Interactive have been trying to achieve something similar with their Global Conflicts-series. Here you take on the role of a journalist trying to uncover and potentially resolve a range of issues across the globe. As in any game, you have to learn something to win, and it is the context of the game that imbues this “something” with meaning, making it more than distant, isolated facts and fragments of information. Induction, research skills, key skills, work-based learning, assessment, activities… use any of these within a course without designing them with the subject/course context in mind, and you’re setting yourself up for unengaged, poor performing and complaining students. One final mention this time around should be Simon Brookes, with who’m I’ve also had valuable discussions on Twitter (where he’s @pompeysie). Simon is working intensively with entrepreneurship education, and he’s using “alternate reality games” (ARG’s) to bridge the “reality gap” between education and “authentic experiences”. What all of these examples goes to show, is that games can provide authentic contexts approximating real-life situations, where students/players are working with meaningful, situated problems instead of learning abstract “content”. As the examples also illustrate, there’s not one right way to design proper contexts. On the contrary, there’s a multitude of inspiring and creative approaches. As a consequence, I’m obviously unable to supply any one simple solution. Whichever kind of education (also the corporate kind) one is engaged in, context is invaluable. We’ll probably never become good enough at designing relevant contexts, but we should never stop trying. We should always strive towards embedding any kind of learning in a context, where said learning actually makes sense. I just read this post, where it is stated, that “smartphones are the next classroom computers”. I definitely agree that using smartphones in education is one of the viable paths we should currently be exploring. These tiny, yet powerful “pocketable computers” provide us with a wide array of possibilities, which, if used cleverly, can obviously contribute to more dynamic, authentic learning scenarios. This presupposes a willingness to challenge existing structures, though. If we just cram smartphones in the classroom in support of current practice, little will be achieved. Technology is not the ultimate saviour of education. People, using available tools in creative and reflected ways, are. The above was not, however, what said post really made me think about. Because of the negative ways students use cell phones in class, like cheating or texting, some teachers say they’re wary of the idea. We all know of this concern. When the walls of the classroom are broken down, ignored as they are by especially digital media, the traditional ways of thinking about and assessing student progression is fundamentally challenged. When everything can be found on Wikipedia, how do we test our students? For several years, the “solution” has been one of creating artifical borders. We’ve been desperately clinging to our old ways, creating a classroom that is becoming increasingly isolated from the surrounding world, and all in order to be able to test and measure students. We’ve been forced to do so, because of the predominant “if we can’t measure it, it’s worthless”-dogma. I can’t help but think about how I myself work and learn. I see no borders, no boundaries. I use the tools available to me, find the information I need and solve the problems I’m faced with. I may read a blog post, which I stumbled upon via Twitter, where I afterwards return to discuss said post. I visit Wikipedia to get an overview, before I may even find a relevant book on the shelf. I mail a friend, we talk on Skype and perhaps I write something here. No problem, no learning process exist in isolation, and I’m thus always involved in an informational ecosystem much, much larger than whichever situation I’m currently finding myself in. If I were still in school, I would clearly be accused of cheating, as I’m not really adhering to any particular set of rigid rules. In many ways, what is considered “cheating” in school, is considered “creative, innovative problem solving” outside school. I don’t have any glorious solution to this problem, yet I’m urgently aware, that we must revise our idea of cheating. When students are “cheating”, they are very often only doing what every single one of us would do; only difference is, they’re in school, we’re not. 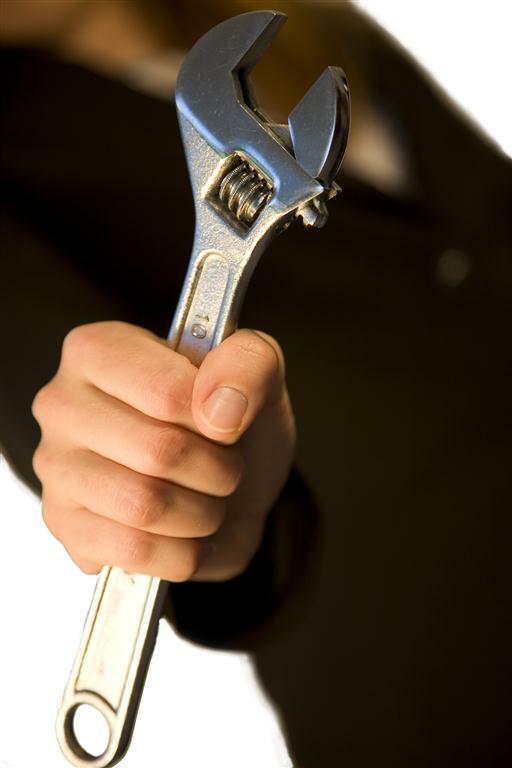 They’re using a wide array of “tools” to solve problems. Instead of our ultimately doomed attempts at preventing this, we should be actively encouraging it. We should be designing learning contexts, where the old notion of cheating is no longer valid, but where the learning process requires students to use tools interactively (after all, that is considered a key competence by OECD and others). We generally need to shift our focus. That which can easily be googled (by cheating) may not be the most interesting in a learning perspective. On Twitter, simoncrook recently wrote, that “if students can Google the answer, rethink the question”. If we pose questions which can be answered by a simple Google search, we pose the wrong questions. Why not shift the focus from factual knowledge towards using tools to solve interesting, relevant problems, which approximate real world problems? Or better yet, addressing actual real world problems. But administration demands us to maintain the rigid testing, you say? Let’s be creative within existing structures, but let’s simultaneously work to change those structures. Nothing is carved in stone; it’s all just a matter of perceptions, and perceptions can change. I have previously written about digital literacy, and will surely continue to do so, as the importance of this new literacy is hard to overestimate. At the moment I am writing a paper for 4th European Conference on Games Based Learning on developing a special subdomain of digital literacy, namely that of games literacy or ludoliteracy, as it is dubbed by American researcher José P. Zagal. Even without moving into this more specific area, talking about digital literacy might easily become muddled and lack a clear sense of direction. What do I, for instance, mean, when stating that digital literacy is important? First of all, I – and most people in the field – maintain, that digital literacy must be about much more than basic functional skills. 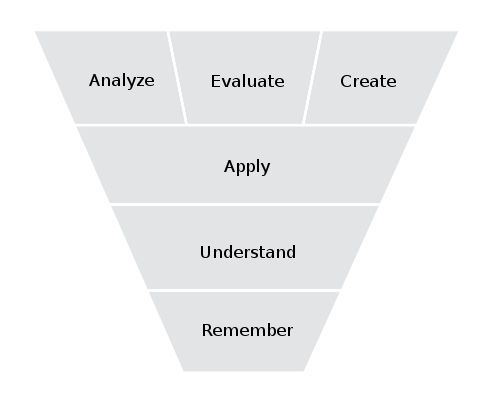 Being able to use digital media is important, of course, but these skills must be supplemented by higher “cognitive levels of complexity”, refering to Bloom’s widely known work on a taxonomy of learning. Without entering a discussion on the validity of the taxonomy, it probably makes sense to see the progression described herein as parallel to the progression required in developing a more holistic digital literacy. 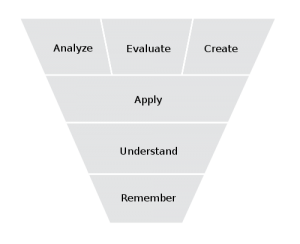 As in the taxonomy, being digitally literate requires more than “applying” digital media. 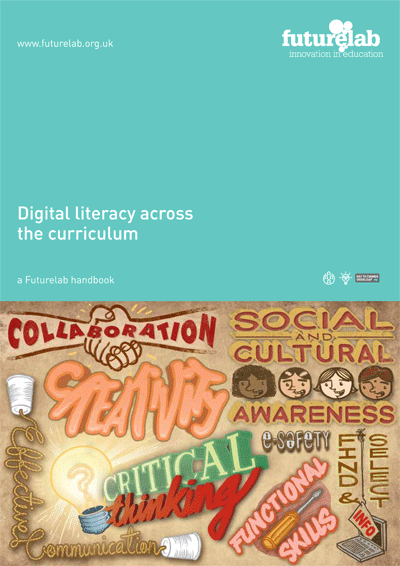 This is the basic premise of a new handbook from Futurelab called “Digital literacy across the curriculum“, wherein the authors make a very qualified effort to turn the pompous discussions into something a bit more concrete and down-to-earth. 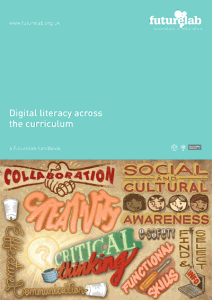 What does digital literacy look like in the classroom? And how can teachers go about developing it within school subjects? Another part of their approach is to list (some of) the discrete components of any overall digital literacy, as they state that ” it can be helpful to think of digital literacy as made up of a number of inter-related components or dimensions”. I absolutely agree, and deconstructing the concept might help demystify it by showing “what’s inside”. Such a take may also consequently force us to acknowledge the multimodality of a comprehensive digital literacy consisting of skills, knowledge and competencies on different levels. Even so, one might argue that the process of breaking a digital literacy into smaller bits and pieces can never result in a fully comprehensive understanding, as any relevant literacy must be inherently dynamic. In addition, a critic could object that isolating components indicates an internal independence between said components. Both points are overly academic, however, and not really relevant in this case. Models work to simplify complex phenomenons, thus making it possible to actually work with them in practice, and this is what’s relevant. The model illustrates the necessity of broadening our scope, and approaching digital media from a number of different perspectives and with different goals in mind. Hopefully this model along with the handbook in general (and all the other tools and publications available) can support the ongoing tendencies towards a more diverse inclusion of digital media in education. “We aim to identify, collect, test and distribute good practice in game based learning. The above is the proclaimed mission statement of the currently ongoing Project GAMEiT, in which I am lucky enough to actively take part. In many ways, this project is right up my alley. The obvious one: it is all about games, and further exploring how they can be creatively applied to support learning. I often argue that we know enough to start using games in education, yet we always need more knowledge. I hope and believe that our project will mark another step forward in this direction. Even more important is the central focus on distributing this knowledge, making it easily available to teachers wanting to begin using game based learning. We are developing courses to teachers, which we supplement with a comprehensive handbook describing the most important aspects of GBL, case studies, inspiration to new approaches etc. Both the harvesting and distribution of knowledge were among my primary focal points, when I begun this quite adventurous and eventful journey of mine. With this in mind, GAMEiT brilliantly encapsulates my initial intentions, and the ground I have covered this far. (If only the time to come is going to be half as exciting, I would be perfectly happy!). I am particularly fond of this project due to the fact, that it is a project supported by the European Commision and their “Leonardo da Vinc” programme“. The technicalities of this are certainly less interesting than the fact, that I get to work together with very skilled and passionate people from different European countries. Being the curious kid on the block, I really appreciate every opportunity I get to meet new people, exchange thoughts and ideas, and contribute to the progression of a common project. It is always a great pleasure and source of inspiration to participate in a project like this, acquiring fresh perspectives, learning about practice outside DK, and being confirmed in the value of my priorities until now. At the moment, we are carrying out fieldstudies, describing chapters for the handbook and meeting online every month. Great things are in the making, and updates will be posted here and over at the official site. Below is the text “GAMEiT in a nutshell”, in which we aim to introduce the project to anyone interested. Please, read it if you like, and feel (very) free to comment below, or contact me for further information. Click to show the text in fullscreen.